Remember, this is the format (as in what's required....not too bothered about how it's presented or listed). Falcon Heavy sitting horizontal today on Launch Complex 39A following yesterday's fit checks. A few more pics of Falcon Heavy on Launch Complex 39A earlier today. FYI the @SpaceX #FalconHeavy is back in the hangar at Pad 39A. 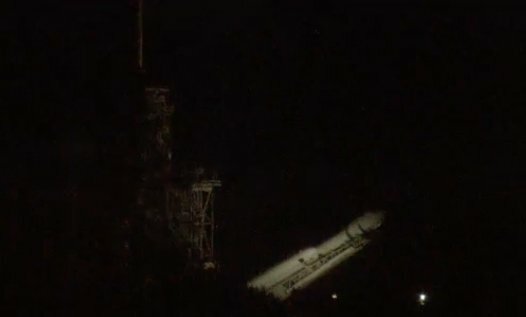 Falcon Heavy now vertical on the former Apollo 11 moon rocket launchpad. At 2500 tons of thrust, equal to 18 Boeing 747 aircraft at full throttle, it will be the most powerful rocket in the world by a factor of two. Excitement on launch day guaranteed, one way or another. Hold-down test fire next week. Launch end of the month. And now on the pad! Great view of the reaction frame as well. And much clearer, posted 10 minutes ago OP also suggests the SF is targeting Wednesday. The Falcon Heavy rocket is going vertical at launch complex 39A ahead of an engine test planned for this week. We keep hearing Wednesday as the likely opening opportunity/window. We're going to have to be patient as this is like three Static Fires at the same time. Prop loading three cores and firing up 27 engines. Do not be surprised if they prop load and "scrub" a few times, but even those would be useful WDR style tests. Lots of people expected to be in the area, so link up photos and such. Hopefully there will be some live streams. Not much point linking paywalled streams as that'll be a dead link to most people....but at the same token you can't reproduce paywalled screenshots on here. #FalconHeavy status update: SpaceX scheduled to attempt test fire between 1300 and 1900 Wednesday. Looking forward to the brief rumble. - by Chris Gebhardt - who's on site near the big rocket.